being repaired by a newborn’s glance. Struggling against a force we all know is true. we have become aware of an unexplainable joy. *Copyright 2006 by James R. Regier. This poem is included in POETRY WALK: Sue C. Boynton Poetry Contest – The First Five Years. Info: Book! Placard design by Egress Studio. *Copyright 2008 by Kristi Felbinger. This poem is included in POETRY WALK: Sue C. Boynton Poetry Contest – The First Five Years. Info: Book! Placard design by Egress Studio. it becomes sea before it hits the ground. that things long settled shift. Terse rain. of ten thousand years. Notched rain. Rain sonata dampened notes, rain on the Pleiades. rain for dinner again; a cloudburst over our tables. An entire epistemology in a puddle at our feet. something new and green is rising. *Copyright 2009 by Angela Belcaster. This poem is included in POETRY WALK: Sue C. Boynton Poetry Contest – The First Five Years. Info: Book! Placard design by Egress Studio. *Poem copyright 2010 by Keajn Wardrop-Peterson. 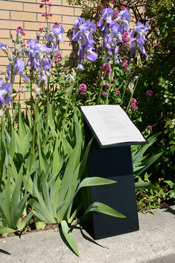 This poem, which also appears here, is included in POETRY WALK: Sue C. Boynton Poetry Contest – The First Five Years. Info: Book! Placard design by Egress Studio. with a jagged little soul. And how I’ve lamented my losses. *Copyright 2006 by Barbara Davis-Pyles. This poem is included in POETRY WALK: Sue C. Boynton Poetry Contest – The First Five Years. Info: Book! Placard design by Egress Studio. The Moon sits on the sky. *Copyright 2009 by Madeline Bowler. This poem is included in POETRY WALK: Sue C. Boynton Poetry Contest – The First Five Years. Info: Book! Placard design by Egress Studio.